1. Cook the cavolo nero in boiling water for 3 minutes, remove with a slotted spoon and place half in a food processor with 100ml of the cooking liquid. Cook the spaghetti in the remaining cooking water for 8-10 minutes, drain and return to the pan. Heat the oil in a frying pan and fry the chicken until cooked through, with no pink meat. 2. While the chicken is cooking, add the garlic, nuts, Parmigiano Reggiano and spinach to the processor and purée to give a coarse paste; season well. 3. 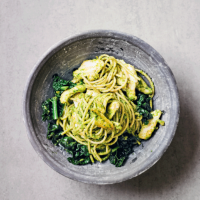 Add the pesto sauce to the chicken and cook for 1 minute then stir into the spaghetti with the reserved sliced cavolo nero. Season well and serve in bowls.